Having moved to north Bangalore a few months back, I’ve been trying to inventory the trees in and around this place for the past few weeks. Commonly seen roadside species in the area are Portia (Thespesia populnea), Large-leaved mahogany (Swietenia macrophylla), Copper pod (Peltophorum pterocarpum), Gul mohar (Delonix regia), Nile tulip (Markhamia lutea), Senna spectabilis, Indian cork tree (Millingtonia hortensis), Simarouba glauca and Buddha coconut (Pterygota alata). I got introduced to the last three after moving here. The apartment complex grounds are dominated by Millingtonia hortensis – they were flowering gloriously for the past few weeks, but this seems to be tapering off now. There are also two species of Tabebuia and a bunch of other assorted species. But the topic of this quick post is this handsome little tree that stands in the north-east corner of the grounds. If only all trees were as easy to identify. 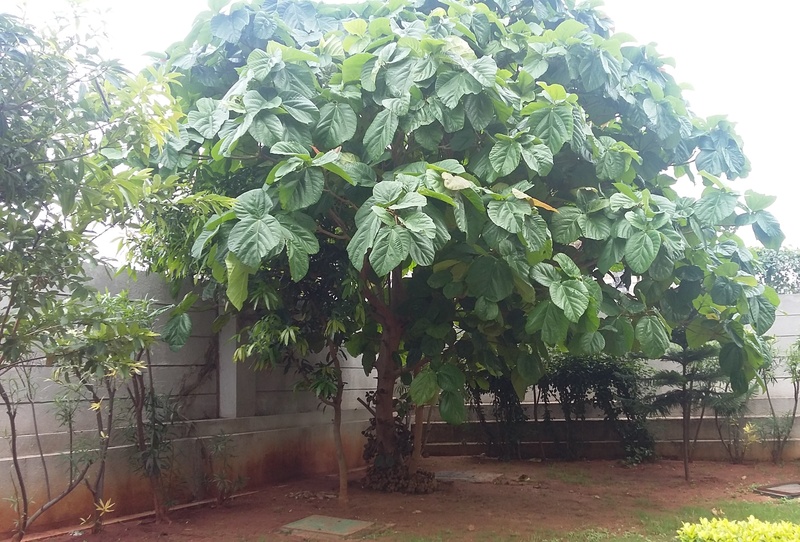 It took me all of three minutes to Google large leaf fig tree to net this one – the very appropriately named Elephant ear fig tree (Ficus auriculata). The specific name is rooted in the Latin auris – ‘with ear’. This tree is evidently widespread all over Asia, certainly all over the sub-continent. The leaves find use as fodder and are also stitched into leaf plates, in places. 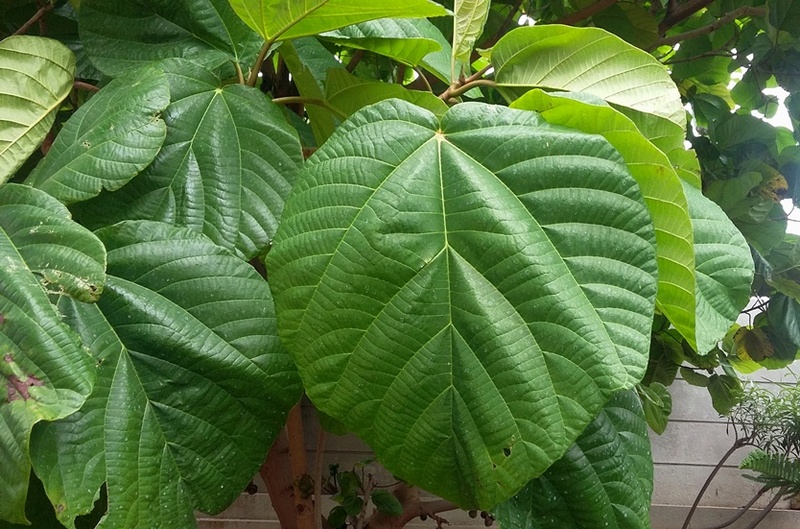 The large, heart-shaped (cordate), wavy-surfaced (undulate), blunt-tipped (obtuse), heavily veined leaves and the cluster of figs bunched around the base of the trunk make for easy, unmistakable identification. 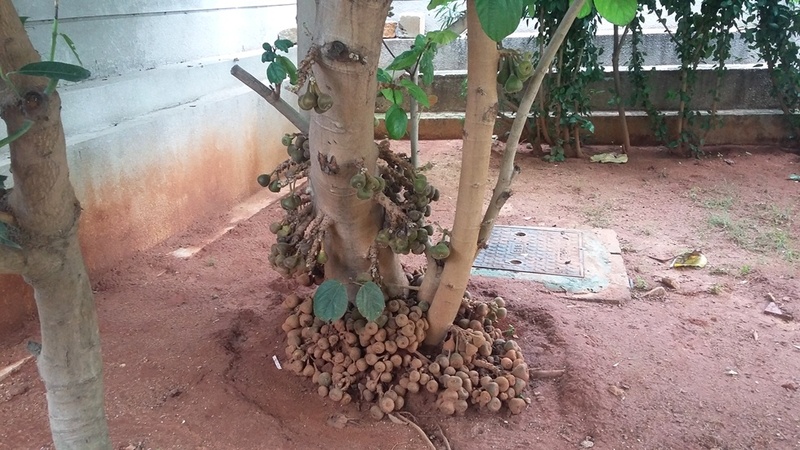 The figs are edible, but I haven’t tried to eat them yet. I’ll have a go the next time I walk by this tree, now that I know they won’t kill me. The tree will flower in early summer, and I’ll post some pictures then. 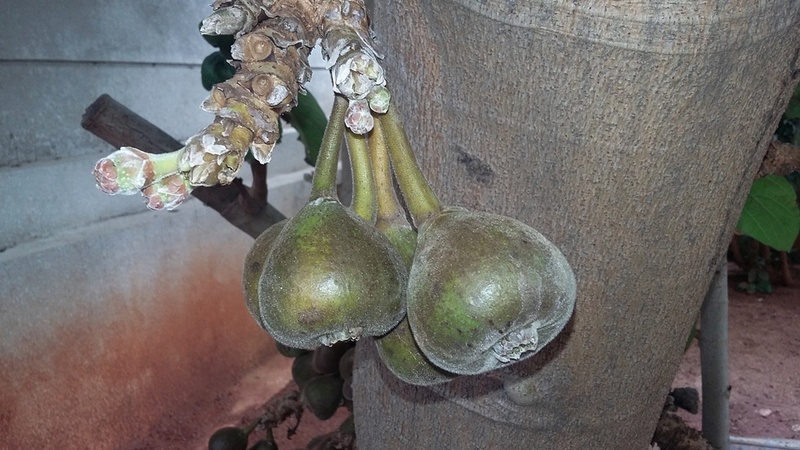 This entry was posted in Trees and tagged elephant ear fig tree, ficus auriculata, indian, Trees. Very simple and nicely described write up with relevant images. Thanks for sharing this Badri! Hope you make this a regular feature so that we could learn about a few additional trees through your blogs. Thank you Vidya! I’m scribbling little things like this that we learn on a daily basis in a little notebook. Thought I’d try this more systematic way of recording some of these snippets for a change. Glad you liked it.